WeighPack Systems Inc. was established in 1992 and is now a global leader . When it comes to automated weigh filling, bagging, container filling and conveying food packaging systems and solutions. The “not-so-secret” to its success is its main cornerstone which is to provide excellent value and service to its customers. Other companies are trying this approach but only a handful are successful in conveying their mission as a leader in the food packaging equipment systems industry and one of them is WeighPack. Being one of the best in the industry, WeighPack offers a plethora of applications and systems that will best suit the needs of its customers. Auger filling technology is mainly used in applications that entail portioning and dispensing of powders, spices, coffee grinds, and other products that have similar characteristics. The food packaging system required for this process is called Star Auger. It is a servo-driven filling machine providing speed, accuracy, and flexibility when packing powders, granules, and other similar food products. Another great benefit of this food packaging machine is that it can be combined with any auxiliary machine including vertical form & seal, horizontal form & seal, and pre-made pouch machines. For combination weighing, WeighPack has us covered with its acquisition of CombiScale, known for its high-quality products in industries such as snacks, confections, frozen foods and others. Conveyors are also available in several selections featuring “clean in place” technology making it easier to use and clean. 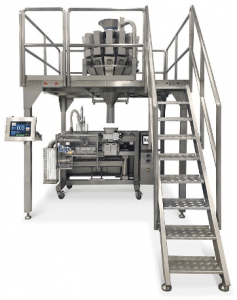 Next is another servo-driven machine called the R2B Horizontal Form Fill & Seal that fills, seals and produces different kinds and styles of pouches in one automated process. Then we have our pre-made bags which are attributed to The Swifty Bagger pre-made pouch machines. These machines are constructed to automatically open, fill and seal pre-made pouches and stand-up bags. The Swifty pouch machines are available in three models; Swifty 3600, Swifty 1200, and Swifty Junior, which varies on bag size and number of bags produced per minute. And if you’re looking for a vertical form and seal bagging machines. We offer the VerTek and XPdius vertical bagging machines.